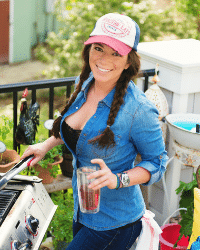 This Girl Carnivore wrangled up a cast of 30 other talented burger enthusiast and we are about to stack, stuff, and slather anything and everything we can between two buns. Sit back and join us for 31 epic days of carnivorous pleasure as July is going to be the biggest, baddest celebration of burgers on the web. Hopefully, you even get a little inspired and step out to create your own #burgermonth creation. Oh, and did I mention there’s a major giveaway going on too? Yeah, you may want to stick around for this one. Because every day a new blogger on the list is posting a recipe, that means that every day, there’s more chances to win. 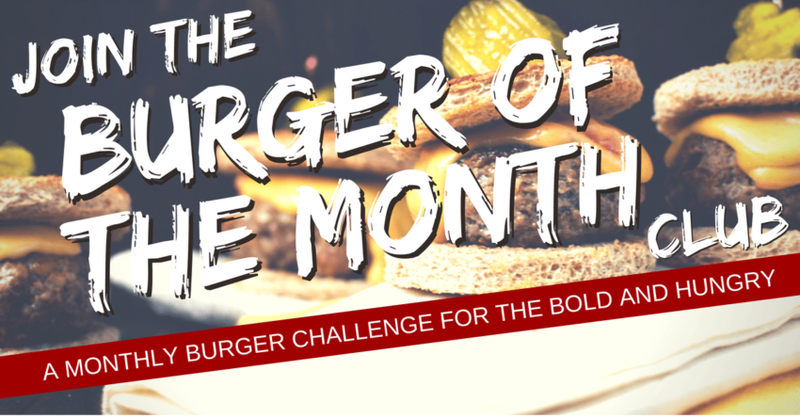 Keep checking all month long on Facebook, Twitter, and Pinterest to see all of the delicious burgers and bloggers participating! 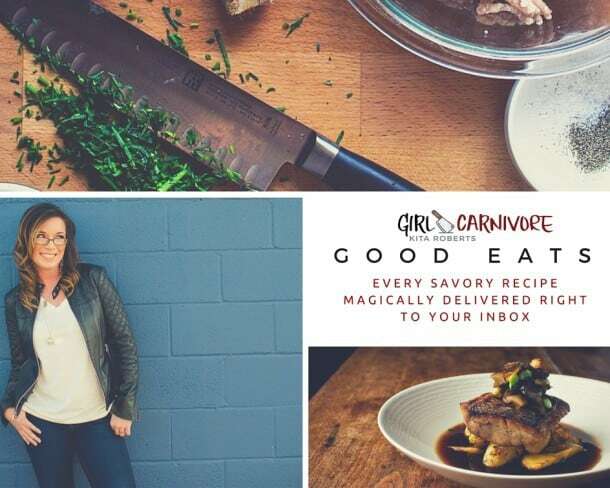 If you want to be sure to never miss one meaty bite, subscribe to the email list for updates right to your inbox. This month just got epic. But we’ll let you be the judge of that. This is my version of a cheesesteak wit - the Philly Cheesesteak Burger with a kicking Roasted Garlic Aioli. Not just a burger, but a burger infused with big beefy flavor, inspired by my local city, and smothered in provolone, peppers and onions. The closest thing you are going to get to a real steak outside of the City of Brotherly Love. Preheat the oven to 400 degrees F. Chip the top bit off of the head of garlic, exposing the cloves. Don't worry about the skin. Place in an aluminum foil packet and drizzle with olive oil. Sprinkle with salt and bake for 40 minutes. When cool enough to handle, squeeze the garlic from the skin and pulse in a food processor. Add the mayo, and pulse until combined. Season with salt and pepper if needed. Store in an airtight container in the fridge for up to 3 days. Meanwhile, preheat your grill for medium-high. Clean and grease the grates. Mix the ground beef, Worcestershire sauce, Montreal Steak seasoning, and salt and pepper in a bowl. Form into even patties with an indent from your thumb in the center. Drizzle a little more olive oil in a large skillet over medium heat and cook the peppers and onions until soft and starting to brown, 8 to 10 minutes. Set aside. 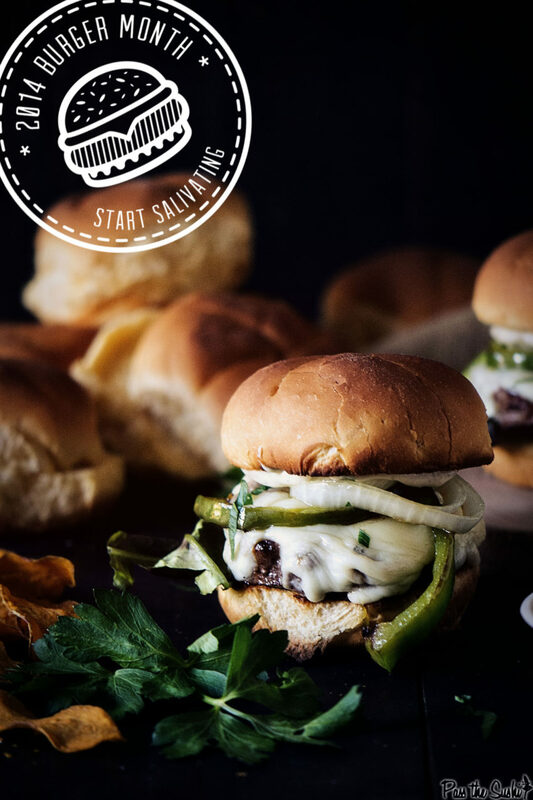 Place the burgers on the preheated grill and cook until done, 5 to 7 minutes, flipping once halfway through. Cover with cheese, close lid and let the cheese melt, a minute longer. 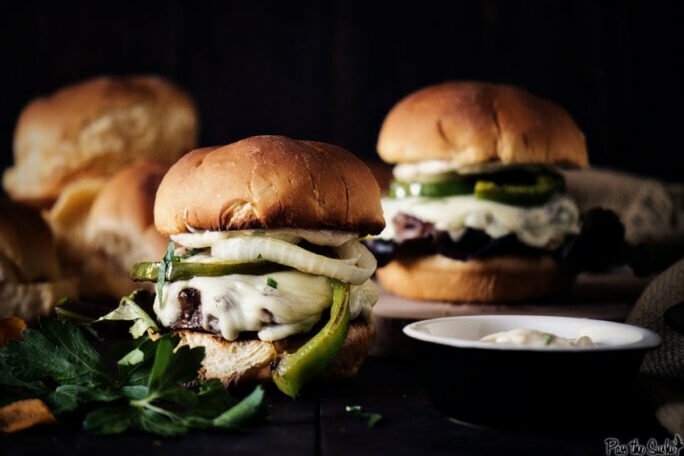 Arrange the burgers on toasted buns with the garlic mayo, lettuce, peppers and onions. Serve warm and with napkins. 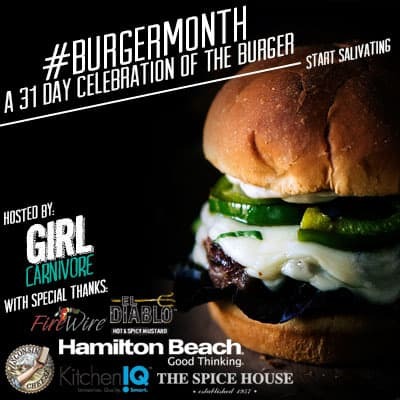 It’s an epic #burgermonth Giveaway! Absolutely phenomenal work, as always Kita. You’ve really outdone yourself with this one. My epic burger is one stuffed with pepper jack and jalapenos! Do you think roasted garlic aioli would be good for my skin? Because I want to shove my face in this burger. I’ve never had a burger for breakfast…but it is early and this is salivating! 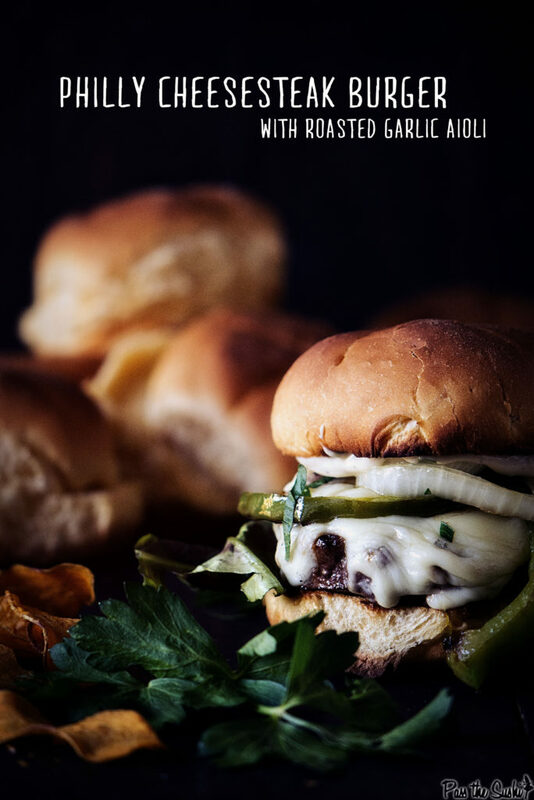 Green chile cheeseburgers…hands down, my favorite thang! It involves a burger, guacamole, jalapenos and salsa. Spicy! This burger looks AMAZING!! I haven’t made too many burgers, but I guess my epic burger so far would be one I added some amaretto to the meat and then stuffed it with havarti cheese. I can’t wait to make this one as well! cheeseburger smothered in queso. perfection. 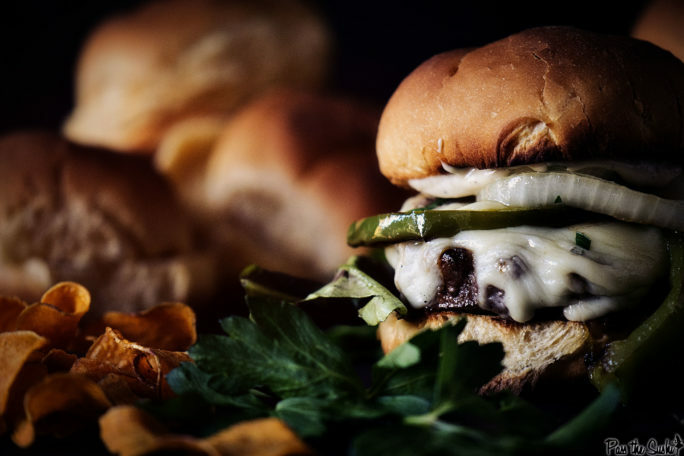 I’m making this burger tonight. I’m from philly and I love those flavors to.